Getting down and dirty with Battle Mole. Drew blames his girlfriend for this one. Here’s hoping that she makes him build more cool stuff. Listen to her, Drew, do what she says! The expression on this mole’s face is adorable. His battle armor makes you wish you never mentioned the word “adorable” anywhere near him…. Sooooo…does anyone else see this and think “Battle Beast”? Gosh, I miss those little guys. Living Tarim, I’m sure that was the intent (the name is Battle Mole, after all). I agree, Battle Beasts were very cool. I love this MOC. The mole’s face is especially great. 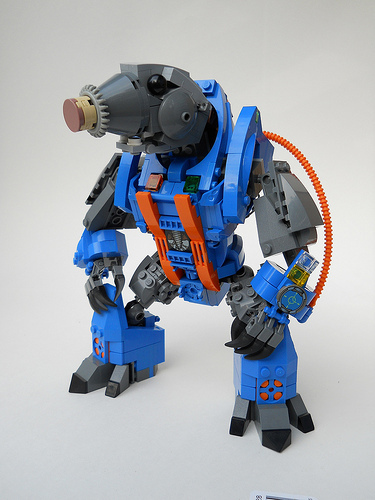 I hope Drew makes more of ’em, so we can get a whole Lego Battle Beasts collection. Whoops…guess I should’ve clicked through to the Flickr gallery, where he specifically says it’s not intended to be a Battle Beast. Either way, it still rocks. it wasn’t built as a battle beast, but it’s obvious where the inspiration came from. there are actually a handful of battle beasts happening already.